I post this picture to get my mothers attention – HI MUM!!!!!! We are well and enjoying our exhilerating family walks on Orkney Island. And no Mum, we will NOT stand too close to the edge . . . next time . . . The Island of Hoy was great last weekend. Scottish YWAM Director Andy Hall was the speaker and there were nearly 60 people. The highlight for me was a walk along the coast to the Old Man of Hoy (picture a few posts back) which is the tallest sea stack in Europe. These cliffs were cool. Thats my daughter Elizabeth standing behind me on the cliff. How was Andy Hall? Did you enjoy the sessions? yes – he really poured his heart out. i was just with him and his wife in glasgow – they gave me a lift to the airport here. nice people -missionaries usually are . .
Breathtaking photo. A keeper. I now want to travel to Scotland! That’s great. YWAM Canada and YWAM Scotland have been partnering with some mission projects recently. Essentially, YWAM Canada has tried to help engage YWAM Scotland with our east coast region, as it is largely Celtic in origin. The east coasts have responded well. wow, what a picture!! andrew you look so young in this picture, thought both people in the pic were children!!! 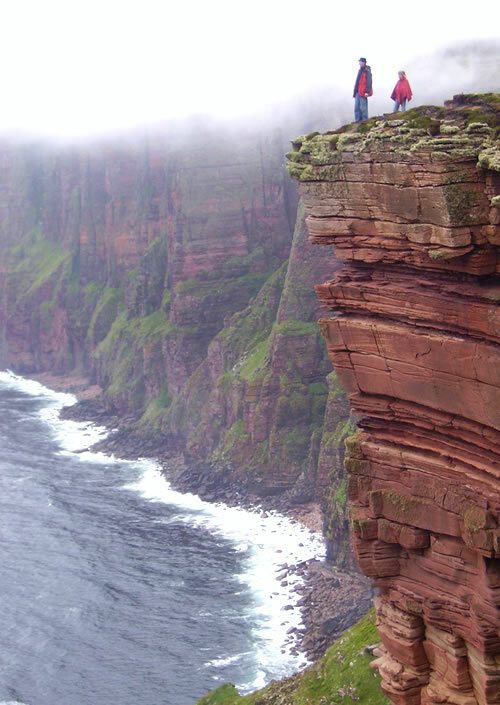 that looks amazing, are there many cliffs like that in the orkneys? breathtaking. Those cliffs look absolutely incredible. I’ve got to get out of the house more often. Enjoy your time on Orkney Island. Great photo, for someone taking a break from blogging, you put the rest of us to shame! Just found you by doing a search for Blogger’s Prayers. Added your wonderful prayer to my blog (with links to you). If you mind, please let me know. I’m glad you told us that was your daughter. I thought it might be one of the gals from emergent no sneaking up behind you. stunning pic, makes my feet itch!!! That looks a little close to the edge. I love this photo. It comes from Andrew at TallSkinnyKiwi and there is a larger version available. Now the madness of last week has subsided Ive had some time to put together a post. nice view from the blog!!!!! !